Understanding if there are conditions to accommodate a puppy in the family is the first responsible step to fulfill. Especially for those families, and it happens often, that they never had a dog. It is often the insistence of children. Approaching the ten years the desire to have a puppy is strong and even the arguments become more convincing. Here’s the step is done. On this site we have often written about the character, temperament, size and other particularities of Lagotto Romagnolo. The Lagotto Romagnolo is the ideal dog as a companion dog for the Family and children. 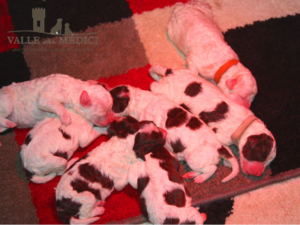 Our task is also to look for families suitable for our puppies. Families who want to have a close relationship with their dog and be good masters. With the knowledge that a Lagotto lives about 15 years and that will depend on them every day. Adopting a dog does not disrupt the life of the family, but it will surely require time and energy. It will also have limits. How the exits and the holidays will be conditioned by his presence. The advantages of having a dog in the family, especially for children, are enormous.. The affection these animals give us is inexplicable. Like the feeling of well-being when we are welcomed back home. A walk with our 4-legged friend is a healthy touch to the mind..
Basically, a dog doesn’t ask for much, but he needs it every day. Are we ready to welcome a puppy? The breed of the dog is important. For example, guard dogs will have different needs than hunting dogs. Will change the education or need for motion. We will have to be able to manage and satisfy the natural instincts of our dog. 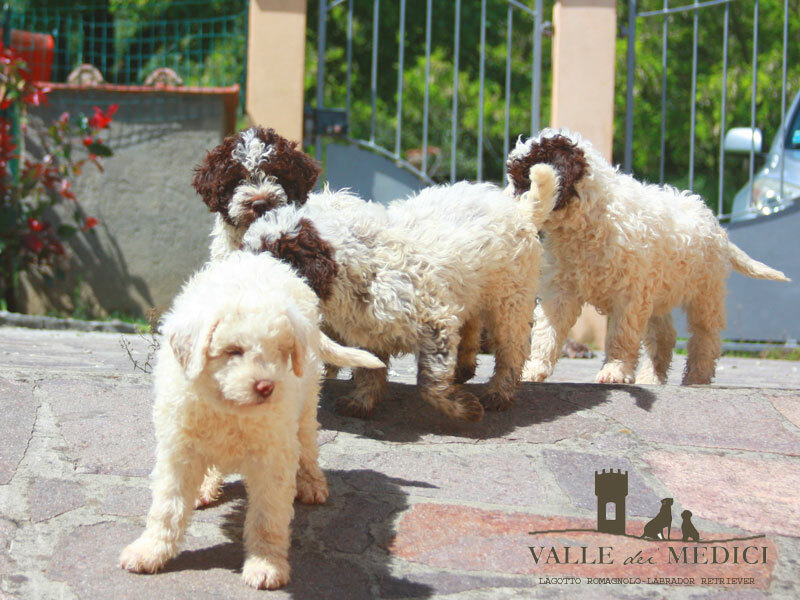 For those who choose the Lagotto Romagnolo the path that leads to understand if we are ready to adopt a puppy is very simplified. The Lagotto Romagnolo is a breed that has no contraindications. His requests to make us “Good Masters” are those of a pet dog who likes the couch, the house and go out for a little fun. All dogs need to be in good physical and mental health every day, and they live many years, and they get older! So! A few questions that as a test can help us figure out if we are ready to welcome a dog into your family. Does the whole family agree to take a dog? The dog will have to be an integral part of the family, and as such relate with everyone. It must never become an element of division and claims such as: “You wanted it and now…” would be a catastrophe! Living with the dog will inevitably be for everyone and for this reason everyone must be in favour of his arrival at home. Over time it will happen even to the most reluctant to have to take care of and relate with the family dog. If there are already other animals in the house, the possibility of coexistence between them must also be carefully assessed. I am thinking about the most common situations of other dogs or cats. Do I have enough space and time to keep a dog? Knowing the breed of your puppy by being helped for example by the breeder is important to assess well. The space can be a limit for those who have an apartment in case piccolo. Especially if it puts its attention to breeds of dogs with large or extremely energetic dimensions. The Lagotto Romagnolo does not need spaces dedicated to him. He will identify himself as the most comfortable place to make his rest. Where to put the bowls will instead be our cure. Having a garden or a terrace makes managing a dog simpler. The space of per se however does not guarantee the happiness of our lagotto. Those who think that having a lot of space to make available to their dog will have to devote less time makes a mistake. Time is a fundamental element for those who decide to have a dog. It is also important that the whole family is in favour of the arrival of the new partner. In addition to making needs the dog needs to get away, play and have contacts with the outside. It is important for physical exercise and psychology. It serves to remain a balanced and pleasant dog for the family. The time to devote to your dog will have to be of quality! Our Lagotto can definitely spend a part of the day alone in the house or in the garden. He will be equally happy if we dedicate ourselves to him, to entertain him and to amuse him in whatever way he is. Equally it will not be enough to stay with us at home all day our Lagotto. Surely you won’t feel lonely, but you will be bored if we don’t find some time to take at least a walk. What financial commitment will I have to support? Knowing the breed is important in order to assess the costs. The breeder can provide useful information. The initial cost of the puppy is only one part, often the smallest of the expenses we will have to incur for our dog. This is why we believe that saving on the initial price of the puppy makes little sense. Especially if we then have to spend more on the health or re-education of the puppy. And without having the certainty of being able to make up for it. Veterinary expenses are an important cost. Taking care of your dog means making annual vaccine calls. Consider unforeseen events or diseases that, just like men, can affect our faithful friend. Old age will also certainly require more attention and care. Eating must be of the highest quality for every dog. Nutrition is his health. Due to its size, the Lagotto Romagnolo is not a dog that eats large quantities. But food, even if dry when of first choice, has a cost. Other expenses may relate to the dog’s objects such as the kennel and bowls, games and the carrier. Grooming and hygiene. Education courses. Holidays are also influenced by the presence of a dog in the family. These are small sacrifices that the dog can reward. Holidays with dogs are possible. We will have to choose those places where dogs are accepted. If we are absent for short periods we should know who we can ask to take care of our friend. Is it time to welcome a puppy? Arrival at a puppy’s house is fantastic. A dog as a life companion is exciting. Sometimes I think that family without a dog is incomplete. Surely mine would be. However, we will have to recognize and understand if we are ready to welcome a puppy and if the breed chosen really suits us. If we do not have the conditions of time, space or the possibility to make some small sacrifice is better to postpone the time to adopt a puppy. https://www.allevamentovalledeimedici.it/wp-content/uploads/2016/06/Scegliere-allevamento-Lagotto-Romagnolo.jpg 600 800 Davide https://www.allevamentovalledeimedici.it/wp-content/uploads/2017/05/logo-VDM.png Davide2017-01-07 21:51:212019-02-05 18:33:14Welcome a dog into the family. 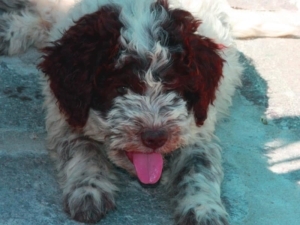 Are you ready for a lagotto Romagnolo puppy?